The MONSTREVAULT has been opened! Rediscovered stock from MONSTREHERO's past is now available again. The MONSTREVAULT contains samples, custom one-offs, prototypes, and whatever else we dig up. Almost all sculpts in the Vault are long since retired and won't ever be re-cast or re-molded! In celebration of the opening, until 11:59 pm ET tonight use coupon code DRIVEMEAPEY to get free domestic shipping on MONSTREVAULT pieces. 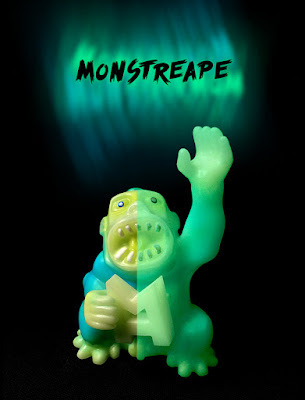 Haunted Scaryglow Blue MONSTREAPE PRE-ORDER now live! It's been awhile but we're back, again! But watch out, we've brought this scary guy along for the ride! The HAUNTED SCARYGLOW BLUE MONSTREAPE is here to give you chills and even some thrills. The 3" tall glow-in-the-dark made-in-Japan soft vinyl MONSTREAPE features fluorescent blue, yellow and white paint and a handmade resin MH logo accessory! We're trying something new for his release; he's going to be an open pre-order starting today (7/20) and ending in a week, next Monday (7/27). He's still going to be pretty limited so no snoozing! Just kidding, take that nap, you look beat. Also, keep checking back in the shop throughout the week for some surprises!